TravStar1 Point Of Sale SystemRegister Manual Gas TransactionsHow Do I De-Authorize a Dispenser? How Do I De-Authorize a Dispenser? 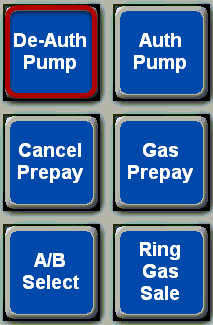 This lesson will teach you how to de-authorize gas pumps. Touch the icon for the dispenser you want to de-authorize. In this example, we will select dispenser number 4. The A on the pump icon indicates that this pump is currently Authorized. Touch the "De-Auth Pump" button. You will see a message confirming that the dispenser is now De-Authorized. Prev: How Do I Authorize a Dispenser? Next: How Do I Change Fuel Prices From the Register?